Here you can discuss issues related to the website or forums. Come say Hi! Start your own thread, introduce yourself, post updates and pictures, check out the history of other members. This forum is dedicated to answering quick questions from new members and old members alike. If you have no inclination to search for answers and more thorough explanations in another dedicated forum, then this is the place to post. Must be smart car related! Inappropriate content will be deleted without warning. 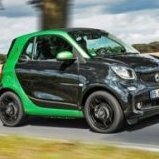 Topics in this forum should be of general interest and directly related to the smart car community, but don't belong in one of our many specific forums elsewhere on the site. Please do NOT post topics in here about maintenance and operation, or parts, wheels and cars for sale, Those topics will be moved without notice. New and old members alike should post in the 'One-off Questions and Other Things Asked Often!' forum if just wanting to ask quick one-off types of questions, or to ask for help with something. Press releases, articles, publication reviews, on television, as seen in the entertainment industry... What's being said about the smart car and by who? Find out. Visit this forum to learn more about the smart car's fuel economy, emissions, and ecological impacts. Members can also share their mileage results and learn about ways of driving their smart efficiently. This is also a forum to discuss vehicle (and driver!) modifications related to improving fuel economy, and any instrumentation devices used to monitor fuel economy in realtime, such as the Scangauge. This forum is for discussion about the production and distribution of smart cars. If you want to know the quantity of vehicles in each province or country, visit here! We maintain lists of special edition smarts, often with the VIN # when possible. This is also the place to visit if you need help with tracking your smartie. It could be in the factory, on a ship, on a train -- or at your dealership! For General Operation and Maintenance discussions specific to the 450 cdi (diesel) sold in Canada as 2005 and 2006 models. For General Operation and Maintenance discussions specific to the 451 Model, sold in the US and Canada beginning with the 2008 model year and ending with the 2015 model year, gasoline engine only. For Modification and Performance discussions specific to the 450 cdi (diesel) sold in Canada as 2005 and 2006 models. For General Operation and Maintenance discussions specific to the 451 Model, sold in the US and Canada beginning with the 2008 model year and and ending with the 2015 model year, gasoline engine only. How-To Technical Articles specific to the 450 cdi (diesel) sold in Canada as 2005 and 2006 models. For General Operation and Maintenance discussions specific to the 451 Model, sold in the US and Canada beginning with the 2008 model year and ending with the 2015, gasoline engine only. This forum is for all discussions about non-smart automobiles - technical characteristics, marketing, opinions, new technology, your other cars and more! For off-topic posting. NO POLITICAL DISCUSSIONS PERMITTED. Have something to say that isn't quite related to smart cars such as a marriage or birth announcement? While not "everything" goes, this is the place to post topics that don't really belong in one of the other forums. A place to discuss the environment and our impact on it. Not necessarily smart car specific but topics should be of interest to the smart car community. A place to talk about smart car configurations, options & accessories to help you in your big decision. Also a place to discuss the various aspects of acquiring parts or vehicles, how to price a used vehicle, and things to look for when purchasing a used smart. This is the Buy & Sell forum for smart car parts and accessories including wheels and tires. No commercial posts permitted in this forum. Listings of smart cars for sale are now in a dedicated forum. This is the Buy & Sell forum for personal listings of smart cars for sale. No dealer listings permitted in this forum. Before posting, please read the topic titled "PLEASE READ FIRST" to understand how to format your listing. Looking for something special for your smart? This is where you'll find it. Have a smart car related business? This is the place to advertise it. Note: All posts must contain item description and pricing as opposed to linking elsewhere. Posts with links only will be deleted. Dealers selling smart cars post offers and ads here. A place to post links or info about parts, accessories, tools... anything really... that you found a good deal on or that you are trying to locate. Or if you want to give a shout out to a business that treated you right. No commercial posting allowed! Karma Based Area to trade/swap/give away smart car stuff - not for stuff to sell! This forum is for discussion of Canada Wide events. Feel free to post your cross-Canada trip reports here with photos. This forum is for events and regionally specific discussions for Southern Ontario, including London and all places between Niagara and Windsor and north to Tobermory. Excludes the Greater Toronto Area. This forum is for events and regionally specific discussions for all places in Ontario between the Greater Toronto Area and Ottawa, including Hamilton, Burlington, Barrie, Belleville, Kingston and then west to the Manitoba border. This forum is for events and regionally specific discussions for all areas of BC outside of Vancouver Island and the Gulf Islands. This forum is for events and regionally specific discussions for all areas outside of Canada. Welcome, I'd be opening the SAM and ECU looking for bad solder joints and green plugs......for a start.....also check front white plug in front of battery in battery box...maybe? Check all ground pins, there are many to check. Check I mean clean, they will all look clean but you may find bad connections when you take apart...? All these are free, and simple, so best to do these first...? Welded up a cracked exhaust bracket and reinforced it.....no more weird rattling sounds now.....also checked all lift kit bolts etc in the rear looking for said rattle, all tight. I am sitting on the fence about removing the lift due to metal on metal clunking when driving over very cracked and busted up roads. Just a bit annoying is all. Also noticed 451 rins are tight fitting compared to 450 stock steels. Just more work....augh! Pulled my back out badly last weekend and now it's really biting me. Installed cheap as chips seat covers just to keep beater seats nice and clean to be swapped into summer car one day as they are black and grey and summers are yellow and show every bit of dirt etc. The beaters are also heated which makes them stiffer and more comfortable imho. Today I dug out an olde 7" tablet and downloaded Ttorque Pro so I can keep an eye on intake temperatures. I also downloaded Waze onto it so it also makes a splendid sat nav. It perches excellently on the ashtray in the centre dash, and 2 small notches cit into the sides of the ashtray (invisible when closed) stop it sliding about. A happy mornings work.